From the Groups page, select the group that you want to edit and from the Actions column, click the Edit Group icon. The Edit Group page opens. It is an exact replica of the New Group page except that this page indicates the name of the account or accounts associated with this group. In this example, the account, Payee Account 3, is associated with the group. To change which accounts are included with the group and/or to modify the group permissions, click the Edit icon. The Access Account-Acl dialog box opens. Review the Use the Access Control List topic for details. To delete the account that is assigned to the group, click Delete. From the Available AWS Accounts section, modify which accounts you want to be included in the group. Click to filter the list of accounts and/or select the accounts you want in the group. 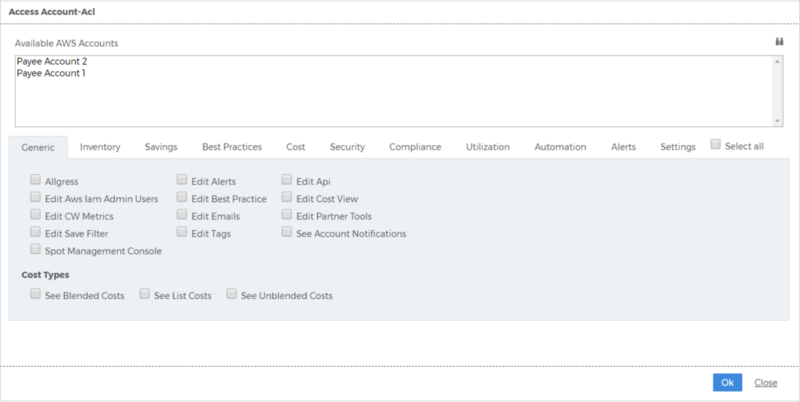 Within each tab, select and/or de-select permissions and functionality as needed. On the Edit Group page, go to the Users for group section and select or de-select the users that you want in the group. Click the arrow keys to move users to and from the lists.